Open Grow™ presents the GroLab™ Automation of the Day video series! These videos will take you on a guided tour of all the GroLab™ functionalities. If you want to see more, check out our YouTube channel or keep following our blog. 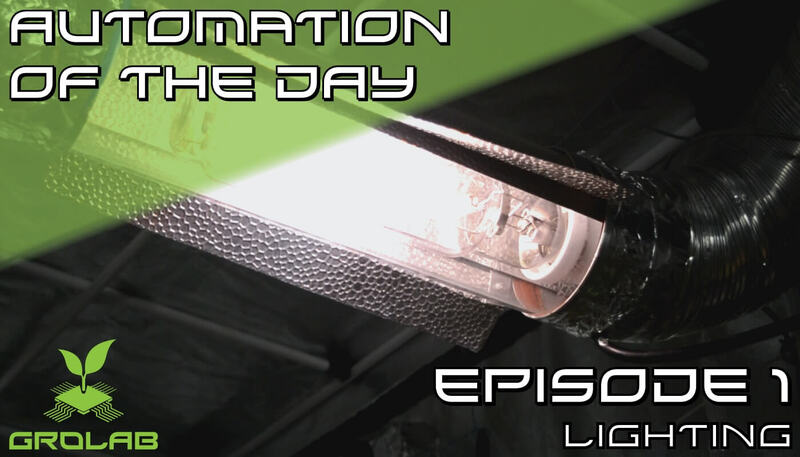 On this first episode, we will show you how to install the GroLab™ Starter Kit (that includes GroNode and PowerBot) and the process to automate the lighting💡 of the growing area🌱. Why is lighting important in an indoor grow? Lighting is extremely important for every kind of grow, because without it there can never be life for plants. A grow light is an artificial light source designed to simulate the effect that sun has on plants, called photosynthesis. There are many kinds of grow lights with many different types of color, temperature, spectral outputs, lumen intensity and watt consumption. And all these aspects vary depending on the kind of plant/grow, stage of the plant, etc. Violet or Purple Light is the coolest/coldest color and it doesn’t do much to a plant, other than improving its’ taste and color, amongst other small aspects. Blue Light is the most important part of the spectrum when it comes to plants. It is essential at the beginning of a plant’s growth cycle because this type of light helps in the production of chlorophyll. This will ensure healthy roots and leaves and also strong stems. Green Light is one of the least used parts of the spectrum by plants. Chlorophyll, which is essential to photosynthesis, almost does not absorb any green color, in fact it is reflected, and that’s why plants are green. Nice curiosity, don’t you think? Yellow Light is pretty debatable if it is of any worth for plants. While some say that plants do use the yellow light and that it helps photosynthesis, many argue that plants are better off without any yellow light at all. Red Light, the warmest/hottest color is on the opposite side of the blue when it comes to color spectrum and wavelengths (being red the longest and blue one of the shortest), therefore red doesn’t give plants as much energy as blue does, and although this color is not very important in the early stages of the plant, it is extremely useful towards the end of its’ life cycle. What kind of light should be used? Many kinds of lights can be used as grow lights, such as incandescent, fluorescent, HID, MH, HPS, LED, etc. HID – High Intensity Discharge Light: The best types of HID lights are MH (Metal Halide) and HPS (High Pressure Sodium). Both of these produce a color spectrum that is somewhat alike to the sun, although the spectrum of HPS is basically orange and red, and the spectrum of MH is essentially blue. Therefore, a combination of both, or MH in the early stages and HPS in the last stages would be the optimal solution. LED Light: These are extremely versatile because we can have them on whichever color we need. We could use almost half red and blue and a little bit of green to complement, in order to get a prime solution. Although HID lights are cheaper than LEDs, in our opinion LED is more effective overall, due to the fact that it has a lower power consumption and it is possible to use whichever color spectrum we want. Difference between Incandescent and Fluorescent Lights: Basically, Incandescent lights heat a metallic filament until it radiates light, on the other hand, fluorescent lights have a gas inside and it’s that gas that glows and radiates light. Both use all light spectrums, although incandescent use mainly red, and fluorescent use mainly blue. Vegetative: Blue color spectrum is the most indicated, as it will strengthen and help the growth of the plant. The most indicated schedule of light most suitable for long-day plants is 18 to 24hours a day. Flowering: The most indicated color spectrum is red because it helps with the budding of the plant and also increases its’ size. Prime light time at this phase for long-day plants is around 12h of day and 12h of night. Then, there are short-day plants that flower during winter, and day-neutral plants that flower regardless of day length. How can GroLab™ help me with my lighting automation? With our software and simple planning, growers can have the confidence that the automation is working perfectly and enjoy the peace of mind that comes with it. GroLab™ Software allows you to create whatever day/night cycle you choose, you can even set 12 hours of day and 8 hours of night, with full disregard for the usual 24h day, thanks to the versatility of the system. And you can also decide if the grow is in its vegetative or flowering state for example. With the lights automated you will not only save money, but also, have constant and even, maximum yield results, by eliminating human errors of any kind. On the next episode, we will talk about the climate🌡 of a growing area.